With the front and rear ends now tacked in, we had an idea of how its all going to work, the list of things that we now need to finish to get this car driving under its new power plant is getting bigger now not smaller. First on that list was to finish the front and rear towers. This means Grub was off to see Neal from Rustride to roll out the rear shock towers so they would look like a factory setup. Rustrite forged a name in the Automotive world for simply being the best in the business and re producing panels that are no longer available or affordable to get, while we where there he was making, Mini door skins, VW Combi split window surrounds, LJ torana boot lids, the list goes on. Grub made a template to get the shape from the top of the tower, this means less molding work once we shape the towers. It also means we can make the towers at another shop and check they are the correct size before we bring them home. This just proves the right tools and equipment are key in a build like this. Once we found the center line of the tower, it only took about 10 minutes to roll them out. To get the towers matching up with the body, we made wooden templates to match the shape of the Civic. Once we make 2 for each tower it was time to mold and shape the towers in place. The time consuming part was to hand fit the curved towers, This was made up of trail fitting, hand shaving the high points and re fitting again. The design that Impossible fabrication created will look factory once painted, The extra time spent on marrying up the towers has really paid off. One of the desired outcomes of this car was to keep a flat boot. This means the fuel tank has to be under the car somewhere, the problem is we have a diff and a drive shaft in place so there was no real room for a fuel tank, That was until Lyle from Gunna Welding and Fabrication dropped past and came up with a solution. 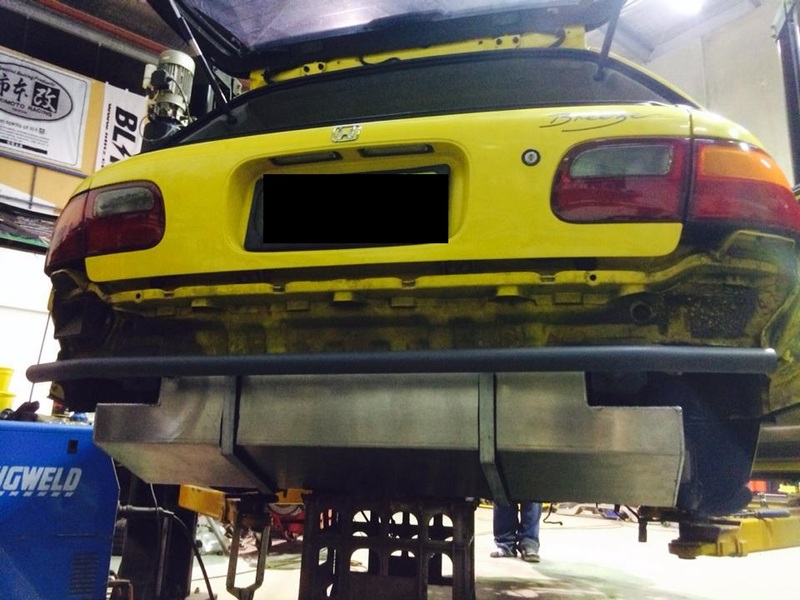 He is going to make us an SLR Torana style drop tank off the rear subframe that will be hidden by the rear bar. When Lyle came back with this tank we were in shock, his craftsmanship and attention to detail is second to none. We couldn’t of been happier. Check out the welds. Lyle had this tank, designed, fabed up and welded in less than 1 week. Because the Civic will be used for lots of different types of Motorsport we needed to make sure the tank would give us a constant flow of fuel. Lyle put 3 baffles in the tank with 100m holes and a 5mm gap along the bottom. On top of this he created a swirl pot (Mini surge tank) in the pick up which means we dont need to run any other tanks in this car to handle 500HP plus. To meet engineering standards we still kept the tank 200mm from the back (metal) of the car, Grub also put his skills to use by fabricating a rear crash bar with 3 crumple zones built in. We will show you more of this feature once the build is complete. The tank fits like a glove, what we were worried about is that we didn`t have enough room to fit a tank big enough to drive on the street. Guna Welding and fabrication got this tank in the space we gave him and managed a massive 44L which is 15 liters more than we thought possible. This was the real test, we wanted to get the tank under the car but not draw too much attention to it. The tank cant be seen from behind the car, unless you are sitting on the ground and looking for it. Big Yella is really coming together, now its time to focus on the front end. Stay tuned for another blog post in just a couple of days.